AMD have pressured Intel considerably in the almost year since the Ryzen processors debuted on store shelves, and the company aren’t stopping there. Ahead of the release of the die-shrunk versions of the Ryzen CPUs in April, we’re seeing AMD release a variety of Ryzen + Vega powered APUs. 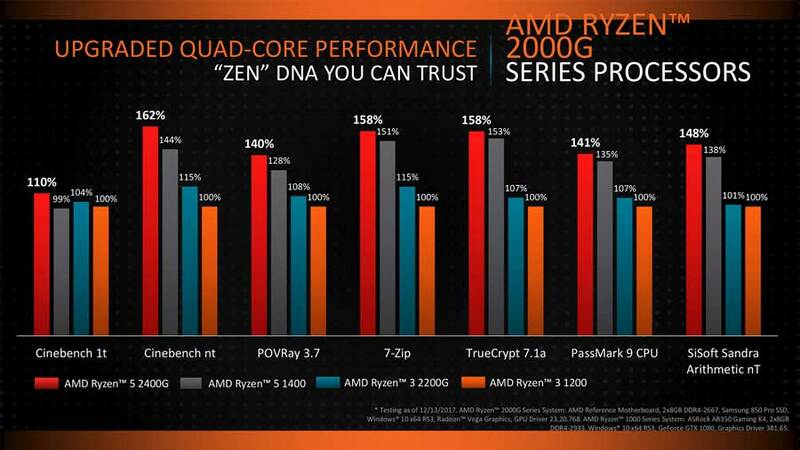 Prior the official review embargo date where NDAs lift, performance results have leaked online for the Ryzen 5 2400G. The Ryzen 5 2400G is a 4 core / 8 thread (thanks to SMT) CPU, running at 3.9GHz boost, and operates with 8MB of L3 cache. This is paired with a Vega 11 graphics chip, boasting 1250MHz clock speed on its 704 shaders. This puts it considerably ahead of its little brother, the Ryzen 3 2200G, whose 4 threads run at just 3.7GHz, the L3 cache paired back to only 6MB and the 512 Stream Processors operate at a more sedate 1100 MHz. Of course, there is a price premium paid here – $169 vs $99 USD for the Ryzen 5 2400G and the Ryzen 3 2200G respectively. 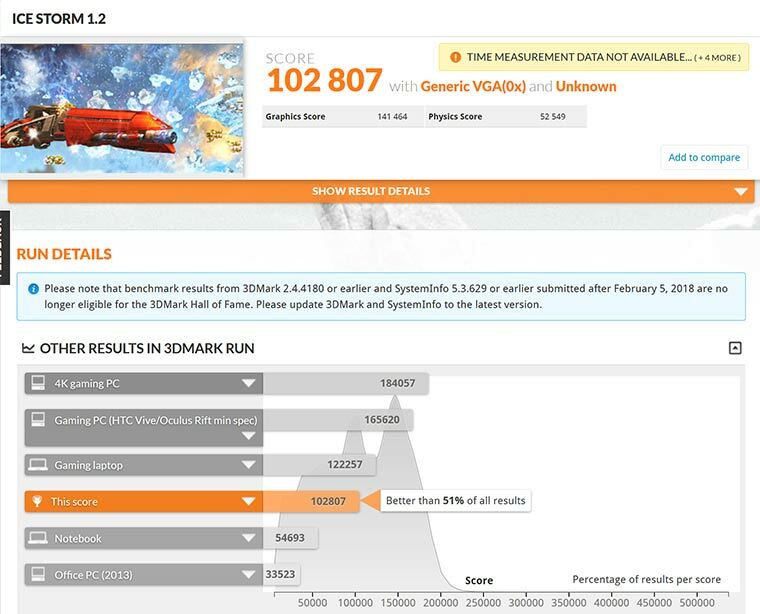 Now we’ve got an understanding of the specs, several benchmarks have emerged on 3DMark, with FireStrikem Time Spy and Ice Storm pulling out reasonably impressive figures. Certainly higher than you’d see thrown about by a typical notebook, but certainly nothing that’s going to challenge a more expensive gaming notebook or desktop. Starting things out with Ice Storm 1.2, we see the testing date of February 2018, and a total score of 102,807 with the Physics Score (measuring CPU performance) at 52,549 and graphics score at 141,464. Not too shabby. Meanwhile, FireStrike 1.1 reaches a score of 5,342, a graphics score of 5,882 and the Ryzen 5 2400G manages to pull out 10,762 for physics. Finally we have Time Spy, punishing the the Ryzen 5 2400G with DX12. Here we score a total of 1882, a graphics score of 1738 and finally a CPU score of 3,549. To put that into some level of context, using Time Spy, that’s about 3x the results of a ‘typical’ notebook, but about half the performance as you’d need to run an HTC Vive or Oculus Rift with minimum spec. 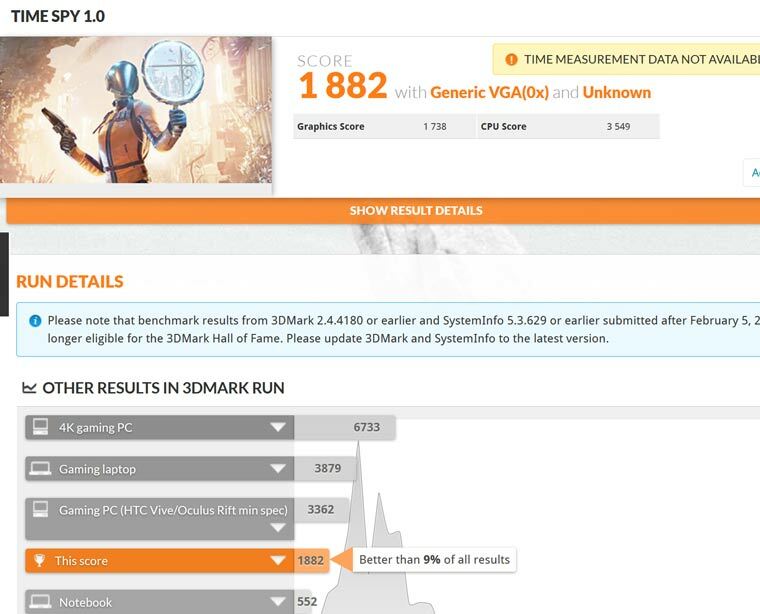 Unfortunately, clock speeds, memory configuration and other ‘things’ aren’t confirmed in these results… which doesn’t fully confirm that these results are the Ryzen 5 2400G (not helped at all with the GPU being detected as Generic VGA). But the performance numbers are roughly on par with what you’d expect with this type of system configuration using discrete parts. Of course – there are a few things to note before we close out. The first is that the performance numbers we have aren’t confirmed with clock speed… so its entirely possible the user has tweaked the clocks from default (either under or more likely overclocking the Ryzen 5 2400G). 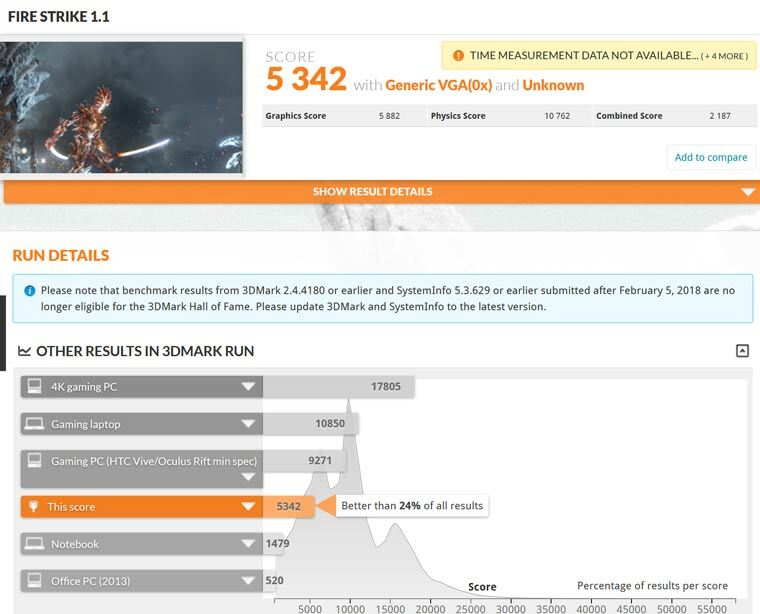 Secondly, although 3DMark results are fairly consistent, they’re certainly not the be all and end all… and without a more conclusive suite of tests, we’d suggest you hold fire on any purchases until reviews come in. Lastly, the max officially supported memory speed that these Ryzen APUs support is 2933MHz, and given that that memory is feeding not just the CPU, but also the GPU – memory clock speed (and possibly tight timings) will likely be a critical factor in performance. Tagged with ryzen, ryzen 5, ryzen 5 2400g, ryzen 5 2400g benchmark.